For the First Time in Forever...Sisters Trip!!!! You might think that would be a LOT of Candy Canes, if you didn't know about Disneyland Candy Canes. Yes, they are very big, and made fresh, but they are 13 for one. Before tax! Not many, but huge instead! Spoiler alert: The migraine symptoms went away and never came back for the rest of the trip. Wahoo!!! I always get worried that something with health is going to ruin my trip to Disney. Does anyone else get that? Like, I'm going to get sick, hurt, migraine, etc. Silly, I never worry about that in real life situations. I have a strong immune system, as I'm constantly exposed to viruses in my work as a school nurse. After riding BTMR twice, we got back on the scheduled touring plan. Picked up FP for SM and got a return time for 9:55-10:55. Perfect! We then rode Matterhorn. I LOVED it, and that would be a theme for this trip. Matterhorn has such an old-fashioned feel to it, the action of the sleds and the progression of the ride are so different from the more modern coasters. I found this really charming. I also was able to use my legs, pressed outward on the sled, to support my body and prevent feeling beat up by the ride. Essential. Sis thought it was a painful ride, even if fun. Next up...we headed to IASW, but it was down for the moment. What to do next? We decided to head into Toon Town. We rode Roger Rabbit, which I didn't love, and Gadget's Go Coaster, which I also could take or leave. Didn't spend much time exploring Toon Town. This has never been a favorite of mine, and I mostly enjoy it when I have a little kid to share it with. We left Toon Town pretty quickly, and headed to Adventureland, where we rode Indie with Single Rider. What a great queuing area this ride has. As for the attraction itself, I don't love it, but it's fine. I like the ride vehicles a lot, and like seeing other groups move through the attraction area from a distance. I also love the big ball. We went from Indie to Jingle Cruise. This is my favorite place in the park, for the queuing area alone. I also love the jungle with all the plants. the animatronics are a big whatever. The skipper makes the ride. The posted wait time was 20 minutes, but it was actually more like 5-10. The line never went upstairs. I was disappointed in this, but knew I would find some way to make it back when it was more crowded, so I wasn't sad. We had a good skipper this go-round. For a lot of the ride, she let a kid in the front say all the jokes, since he knew the script pretty well. I thought that was sweet, and when she did deliver the punch-lines, her delivery was great. We made our way out of Adventureland, on our way to SM, but I wanted to take a peek into frontierland to see if Farley was fiddling. He was, and I got in on an audience participation version of the 12 days of Christmas. Sis took some pictures and video. I love Farley, he's my favorite Disneyland performer. If you don't know him, he's been doing small crowd comedy and fiddling shows at DL since the 1980's. I never saw him as a kid, that I remember, and just discovered him on the Big Thunder trail in 2013. I've made a point to see him on the 2 trips I've taken since. After having #funwithfarley, we headed back to SM for our FP. We grabbed a FP for Star Tours on the way. Hyperspace Mountain is the best ride overlay ever! I'm from the Star Wars generation, and as much as I don't really enjoy the movies, I like the aesthetic and the sense of modern myth that comes with. The music is familiar and I like the idea of liking it. I just am not an action movie person, so once the battling starts, I'm no longer interested. Anyways! We rode HSM with FP, and it was GREAT! I mean, way more exhilarating than I remember. I'm sure they haven't changed the track, but then, maybe they have. It seemed more thrilling, smoother, and faster than I remember it. Is that possible? That, in combination with the theming that gives the ride a sense of progression, makes for a change for the positive in my book. Totally super fun!!! My goodness, talk about a jam packed day! You certainly got through lots on your first day. You all have gotten so much done this morning. I'll have to remember Farley whenever we finally get to go back to Disneyland. Considering how you were feeling earlier, you certainly packed a lot in on this day! We do like to go commando early. I really enjoyed the drama of getting a wristband for candy canes. I'm glad Sis wanted to do that! It was silly and fun, and didn't cost me a dime either! I took a bunch of pictures on my iphone, but I have never uploaded them anywhere, they just sit on the phone. Any kind souls want to walk a gal through it? I know i could figure it out, and maybe I will. One of the most enjoyable things about being a Farley fan is seeing the other Farley fans out there. The first day, he had a woman in her 70's (guessing, hate to be wrong) stop in to show him a photo fossilized crocodile skull she found on the beach. They clearly had a history of many conversations about fossils in the past. The next day I spent a little alone time watching him work from a distance. He had to keep the "old time" friends in line and at bay as he payed due attention to a girl he had roped in for a photo. I've seen people bring photos of themselves with him from the 80's, Grandmas with their Grandkids saying "the first time he met you he was a baby", all that kind of stuff. Really neat. Plus, he knows every joke, nearly, and is an excellent fiddler. I was feeling really really tired at this point. In fact, I began talking about going back to the hotel to sleep. I hadn't had a full night's sleep in over a week, due to hormone weirdness, holiday movie watching, and excitement about the trip. I was just plain beat. We decided it was time for lunch, both because we were a little hungry and because we just needed a rest after the commando touring. As a faithful disneytouristblog reader, I was eager to try the fried chicken at the Plaza Inn. They had ample seating in the sun. It wasn't warm today, but it was in the 60s during the day, and it was clear. Happily, Sis was into sharing meals on this trip. That worked out really well. Before we left, our parents gave us some mad money, and I decided that mine would go to any in-park purchases. With each purchase I took a picture of what I bought next to the card they gave me with the $, with the change peeking out. So, I definitely have a photo of the chicken, perhaps I'll get a photo uploaded at some point. Mine didn't look quite so fancy, since I got it in a to-go box, but it did have a cunning little red-capped sugar mushroom for garnish, which I can't find a picture of anywhere. My opinion: Everything about this treat was excellent, except for the cool whip garnish, which was absolutely gross. But whatever. The cake and buttercream was amazing, and it had lots of little crunchy pearl things on it that gave it texture. Each bite had some crunch to it, as if they mixed in large-crystal sugar with the buttercream. I really liked it a lot and would get it again. I don't like lots of sweet, so this lasted me 3 sittings. I learned later that it is only good cold. If the buttercream was soft, it really wasn't worth it. I had a few bites of it at room temp, and said "what a waste!" and threw it in the motel room fridge to have later, when cold. Enough about Yule Log... But I do recommend it! Up Next: A bit more in Adventureland, and we are off to CA! Ok, that yule log looks amazing! We have some yule log here and I think I might have to open that tonight! Wow that Yule Log looks so good and I'd be all over that! 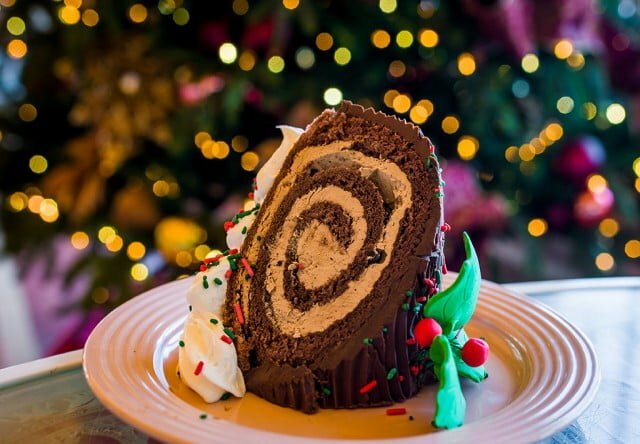 Your meal sounds delicious and that Yule Log looks beautiful! Hey faithful readers! I hope to finish this report...though the memory banks are not what they once were! I'll make some notes and hopefully finish reporting on the sisters trip soon! 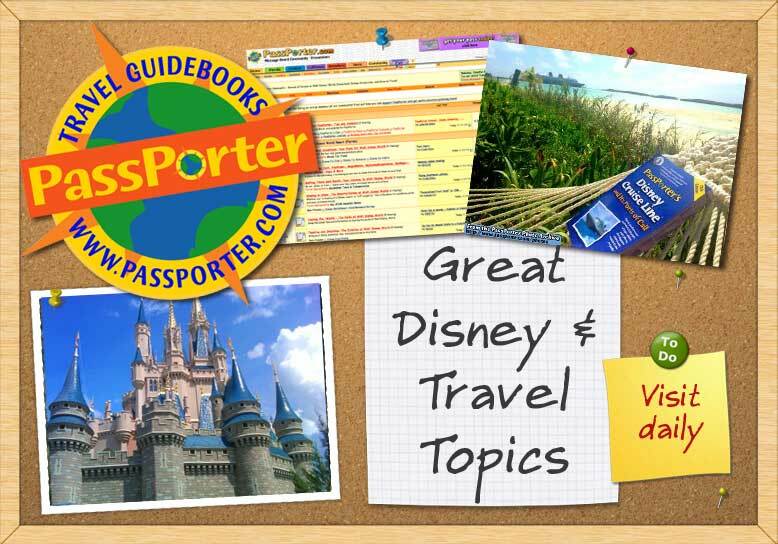 KimmyAnn1147 I absolutely luved reading thru this pre trip and trip report. I really thought the pre trip Outfit report was awesome and the Yule Log look very scrumptious. I basically took a glance you your report so I can get some ideas on how I can set up my Trip Report I am going to for my Sweet 16 that happened late October into November last year. I won't have a Pre Planning Report like you did so well because Mom surprised me and took me out of School for 5 days so I didn't know we were going. Lindsay, I hope you have a great time writing your TR! I'd love to finish this one, but now I can't really remember the details!